KIKO'S HOUSE: Matt Whitaker Says Maximum Bob Is Close To A Wrap. What's Really Going On? Matt Whitaker Says Maximum Bob Is Close To A Wrap. What's Really Going On? Given the state of play in the Russia scandal -- Donald Trump and his sycophancy pushing back harder and harder as the bodies pile up, now some 37 indictments involving 199 criminal charges in all, the best news that we've gotten in a while -- the icing on the Roger Stone layer cake, as it were -- is Acting Attorney General Matt Whitaker's stumbling declaration that Special Counsel Robert Mueller is close to wrapping up his investigation. Asked what the status of Mueller's 20-month-old probe was at the end of a press conference on Monday after the Justice Department charged Chinese communications equipment-making giant Huawei with fraud, Whitaker initially said he would not comment about an ongoing investigation. He then hemmed and hawed before finally responding that "I have been fully briefed on the investigation and I look forward to Director Mueller delivering the final report. I am comfortable that the decisions that were made are going to be reviewed. Right now, you know, the investigation is, I think, close to being completed." 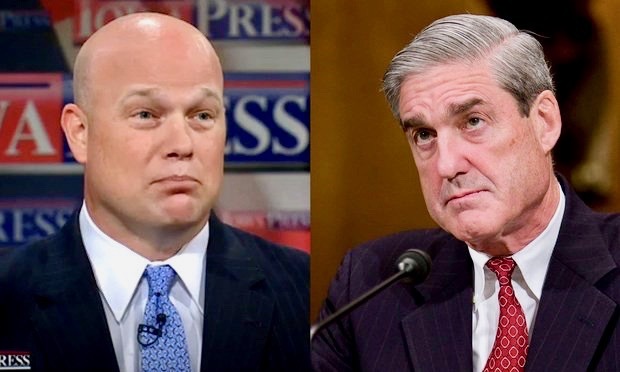 [E]ven if Mueller is close to being done, reports from [Whitaker] that this is heading towards a report should be taken as the statements of a man hired to make statements like this. The actual evidence suggests that Mueller is still pursuing damning conspiracy indictments. In other words, Whitaker was saying what Trump wanted to hear. And what is "the actual evidence" to which Marcy refers? Evidence of a conspiracy, more or less the legal equivalent of collusion. Which in this case is evidence that some or perhaps many of the 17 or so Trump campaign officials and advisers who had more than 100 contacts with Russian nationals and WikiLeaks, or their intermediaries, as a recent New York Times analysis found, were co-conspiritors in the Kremlin's successful effort to cybersabotage Hillary Clinton's campaign and elect Vladimir Putin's orange-haired poodle. Of those 17 officials cited by The Times, six have been charged with criminal counts by Mueller -- Michael Cohen, Michael Flynn, Rick Gates, Paul Manafort, George Papadolpoulos and Stone -- although many of those counts are so-called process crimes such as lying to the FBI or congressional committees. But the Stone indictment seemed to leave open the possibility of a superseding indictment. And there is reason to believe that Mueller still has at least a few rocks to turn over in nailing down evidence of a conspiracy, as well as the possibility (probability, some might say) of indictments against Julian Assange, Donald Jr. and Jared Kushner, among others. It can be argued endlessly whether Mueller is indeed wrapping up, whether we're at the beginning of the end, or the end of the beginning, or . . . And is "soon" next week or next June? One thing is perfectly clear, however: The denunciations of Mueller by Trump, his lawyer Rudy Giuliani, West Wing minions, Vichy Republicans in Congress and the rest of the president's sycophancy are growing more shrill. The special counsel's footsteps have grown thunderous and Trump is increasingly desperate, so desperate that he is capable of engineering another government shutdown in what would be an ultimately futile effort to turn back the tide engulfing him. Or how about provoking a war in Venezuela? As we have learned to our dismay, anything is possible with a man who would sell out his country. "Others go silent when indicted," noted one pundit of Stone's latest circus act. "[But] Stone went on CNN, ABC and Fox News to tout his website and his next book ('Woodward and Bernstein: The Godfathers of Fake News') and to raise $2 million for his legal defense fund." Amidst his cockwalking, Trump's longest-serving advisery did have a serious message: Trump's presidency is in mortal peril because the Russia scandal investigation amounts to a "speeding bullet heading for his head." And look at how Whitaker is straining to say something, anything, that might be taken as a negative comment about the investigation: " I am comfortable that the decisions that were made are going to be reviewed." A double passive-voice construction. Thus we don't know whose decisions will be reviewed, nor who will be doing the reviewing. I hope Mueller doesn't lose too much sleep over that. Whitaker comes off in all of this as a hack in over his head trying to keep out of the line of fire. He no doubt has been a big disappointment to Trump. He definitely is not a reckless Roger Stone type and will likely find ways to make a comfortable living in the slime pits of the far right long after Trump has left Washington. I am quite confident that Matt Whitaker has fewer clues than Inspector Clouseau.